Proclaiming that “we will not forget and we will not go quietly,” approximately 70 Chi Theta Chi (XOX) residents and members of the Stanford community marched on the Office of the Vice Provost of Student Affairs (VPSA) on Monday morning in protest of the University’s decision to terminate the house’s lease. 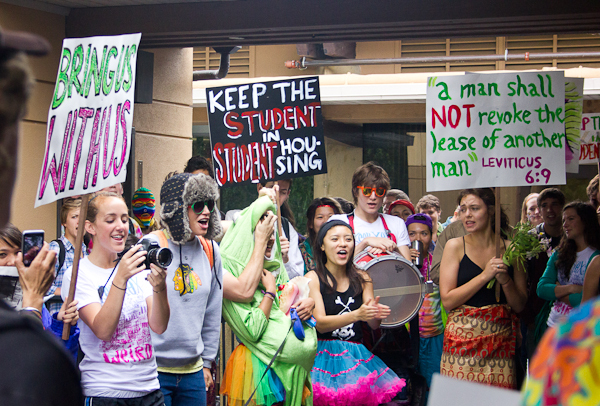 Led by drums and bearing placards with slogans such as “Home is where the lease is,” protesters walked from XOX to the Tresidder Union office of Student Affairs, where they called on Vice Provost of Student Affairs Greg Boardman to engage in a direct dialogue with residents about the house’s future. “We are distraught by the failure of [University administrators] to acknowledge our repeated attempts to demonstrate the value of our student-owned and managed community,” said Kelsey Grousbeck ‘12, a XOX kitchen manager, reading from a statement signed by all XOX residents and eating associates. XOX residents have expressed concern in recent weeks at the lack of input they’ve been granted in ongoing negotiations between the University and the XOX Alumni Board, a sentiment echoed in the statement. Stanford officials voted to let XOX’s lease lapse for at least two years, during which time Stanford and XOX will jointly manage the house. Grousbeck argued that the introduction of joint oversight — between the University and the Alumni Board — of the house for an interim period lasting “a minimum of two years” would jeopardize the house’s culture of independent living and the institutional memory of that experience among students. “Without the knowledge of the level of responsibility required to run the house and maintain our community values, the lease would fall into ineffective hands,” Grousbeck said. Residents also sought more immediate clarification by the University on issues identified as particularly pressing, such as the ability of the Alumni Board to retain control of the lease during the interim period, the ability of residents to continue to pay rent to the Alumni Board and the restoration of the lease by the time current sophomore residents are seniors. The statement’s sentiments were echoed by Daniel Mattes ‘12, kitchen manager at Enchanted Broccoli Forest. Mattes argued that the XOX lease issue has been symptomatic of more rigorous University oversight of the co-op community, leading to a “sense of constant suspense and fear” for co-op residents. “We stand in full support of Chi Theta Chi, and we find it deeply disturbing how the University has handled this,” Mattes said. Boardman acknowledged that there are “a number of issues here which we need to go through” and offered to converse with a smaller number of residents in private. When his offer of a smaller gathering was refused, however, Boardman returned to his office while protesters remained outside to further express their discontent with the lease issue. After spending just over half an hour outside the office of Student Affairs, protesters gradually dispersed or returned to XOX. After the event, Boardman acknowledged that the lack of student input in ongoing negotiations was “understandably frustrating” for XOX residents, but argued that the focus on the lease — a legal document between the Alumni Board and the University — meant student input had been harder to incorporate. Alex Kindel ‘14, a marcher and a former ASSU Senator, expressed optimism about the degree of student involvement in the protests, but criticized the response by administrators.